Barrier Security Products has a range of anti slip rubber floor matting, ideal for a number of industries. Designed to be oil resistant and to provide an anti-slip and anti-fatigue surface, this anti slip rubber floor matting has a wide range of domestic, industrial, commercial and agricultural applications. It is manufactured from hard wearing red rubber. Measuring 910mm x 1520mm x 13mm, the anti slip rubber floor matting is coloured red to highlight its oil resistance properties. 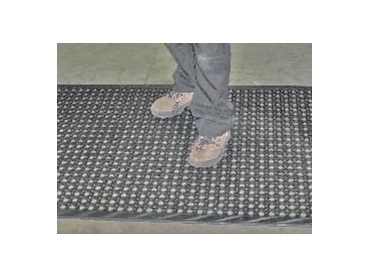 The anti slip rubber floor matting is also available in standard black. Weighing 10kg, this anti slip rubber floor matting is popular with restaurants, hotels and nightclubs. It ensures a safe environment for both staff and patrons.